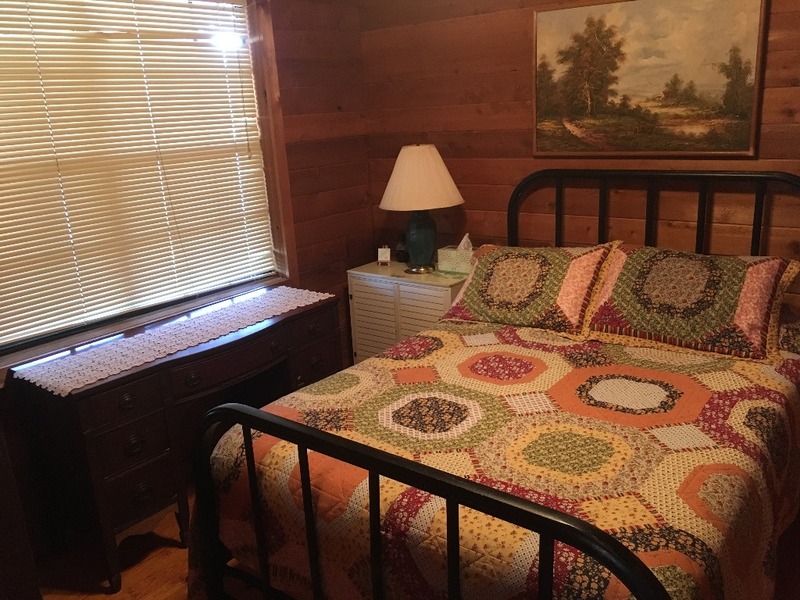 Our quiet little cabin is the perfect find for two to four people to get away, yet close enough to town that you will find many restaurants waiting to serve up what ever your palette may want. It's one bedroom and foldout couch comfortably sleep four people. The kitchen area features a window view of the pasture as well as a full size refrigerator, microwave, toaster oven, coffee maker, and a hot plate. Utensils, dishes, pots and pans are provided. From the front porch you'll enjoy your first cup of coffee from the swing while listening to the birds sing from the trees or the fish splash in the lake. 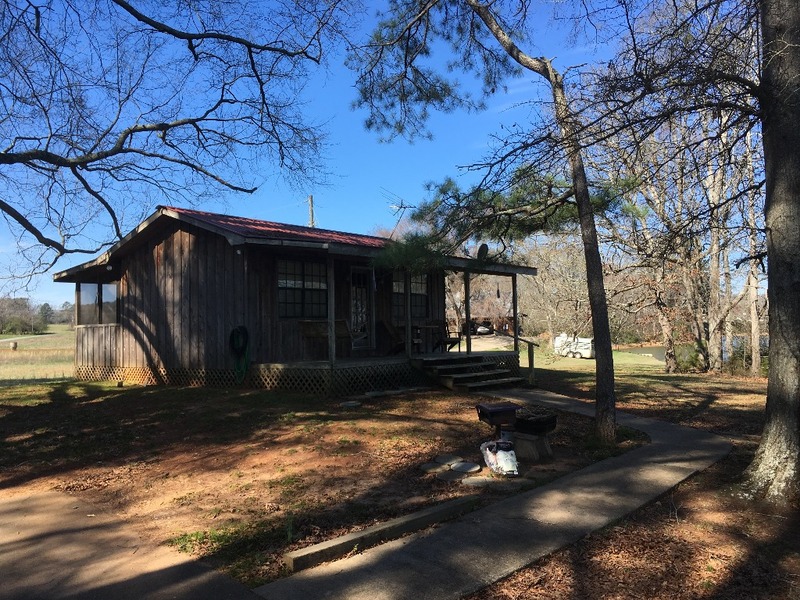 The Cedar Cabin is located 10 miles South of the I-20 exit 158 on US 231. Turn left on Lakeshore Dr.
Our rustic cedar cabin lies on the backwaters of Logan Martin Lake, "the lake of a thousand coves". Our slough has moderate boat traffic on the weekends and very light traffic during the week. Just right for a place to get away from it all for a couple of days or a couple of weeks of serious fishing. The small cabin offers one bedroom with a double bed and a fold out couch in the living area. The kitchen has a full size refrigerator, microwave, toaster oven, coffee pot, and a hot plate, there is no stove. Dishes, pot and pans are provided, but if you have a favorite pan you like to cook in, by all means bring it. Outside is a park style grill. All renters must be 25 years of age. No Smoking. Alcohol consumption is not expressly forbidden, however intoxication will get you evicted, no refund, no questions asked. Wash and put away all dishes, utensils, and coffee pot. Lay damp towels and wash cloths in tub. Towels and wash cloths that are soiled and don't come clean will be charged to you. Put all garbage in container at the street. Leave the key on the kitchen table. 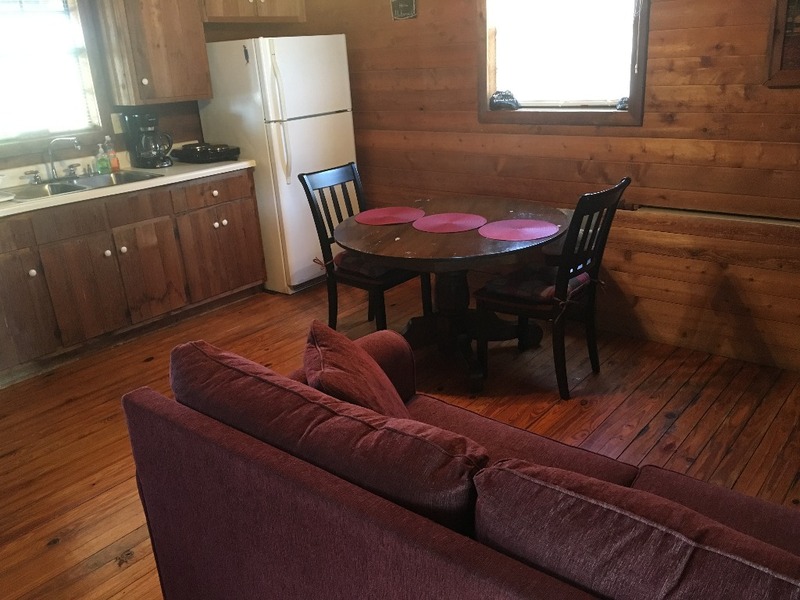 The cabin is well suited for fishermen, boaters, and folks just looking for a get-a-way. We have wifi and tv, but no cable or satellite. If you're looking for a fancy gourmet kitchen or a kingsize bed, we apologize. It is located on a paved drive with covered parking for a boat. We are on a flood control lake, so we are at full pool only 5 to 6 months of the year (Spring to Fall).  Boat launch is available on site or nearby. You won't find another place where you can watch the sun rise from the front porch and watch it set on the screened in back porch. The cabin has hosted fishermen from Bassmaster Champion to friends meeting here to cash in on the Spring crappie season. Writers have come here to find quiet time for their pen to find inspiration and readers have sat on the porch swing and enjoyed countless books. Whether you are just looking to wet a line or while away the time, our cedar cabin can do just that. Over the past 20 years of renting our cabin, we have had guest from Canada to California, Florida to Texas, Louisiana to Ohio and many parts in between. We have just the one cabin that serves us as a guest house and and serves others as a quiet place of rest or a fishing base camp, or a place to chill out after a day of swimming and skiing. We live close enough to the cabin to attend to problems if it were to come up or bring some extra towels if needed. But far enough away to not bother you. 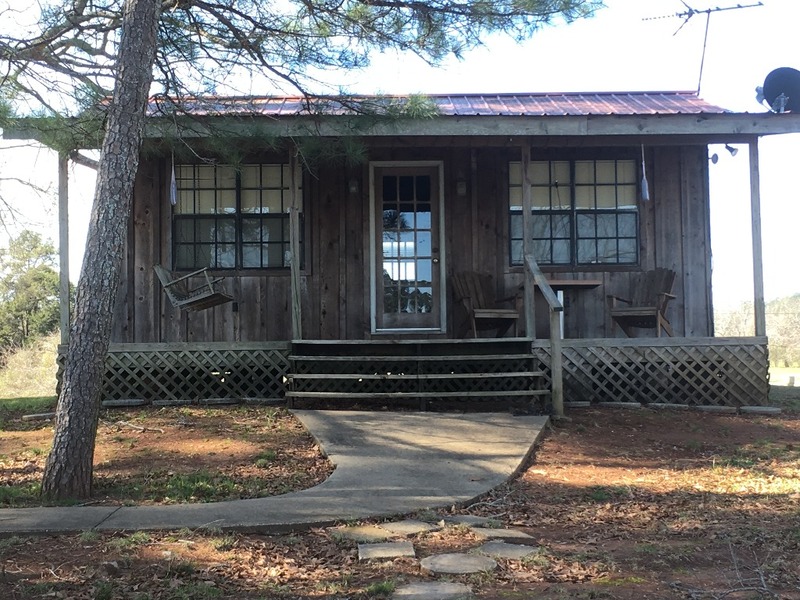 The cabin's unique location gives you the opportunity to enjoy one best bass and crappie lakes in the world, yet be just a stone's throw from town, or 40 minutes to B'ham or 2 hrs from ATL. We've enjoyed sharing our little corner of the world, come visit and see what it's all about. We stayed in the cabin over the Labor Day weekend and had a blast. The kids swam all day and we grilled out several delicious meals. We also loved the little dog that was the welcoming committee. We will definitely be coming back! This is our 4th year coming to the Cabin to stay. Love the location and view! We bring our boat from Indiana and fish from dawn to dusk. My family of 3 stay very comfortable in the cabin. We cook all our meals there. We share our catch with the owners dog Piper during our fish fry. You won't find a more reasonable place to stay for your next getaway or fishing trip. The boat dock is 20 steps away. The boat ramp is the only thing not usable during the winter pool months but don't let that be the downer. Plenty of marinas close to launch from and then dock your boat for the rest of your stay. See ya next year! So glad that the fish were biting. It seems ya'll make the most out of your time on the water. Thanks for inviting Piper to the fish fry! We love this little piece of heaven! We have been fortunate to stay here several times over the last few years. Each visit has been so relaxing and the fishing from the dock is perfect! We have caught crappie, catfish, bass, carp and more! It is a perfect getaway! From sipping coffee on the front porch swing while watching the sunrise or sipping tea from the screened in back porch while watching the sunset, you will feel a million miles away! This cabin is very rustic but has all you need! The bed is also very comfortable! The Bryant Family are wonderful to work with and very accomodating, all while respect ing your privacy. We are going back again in May! Thank you so much for your kind words. We always look forward to your visits. We'll see you in May!! !